A Severe Thunderstorm Warning was issued for LaSalle, Kendall and Grundy counties Monday night as a bout of severe weather rolled over the Chicago area. 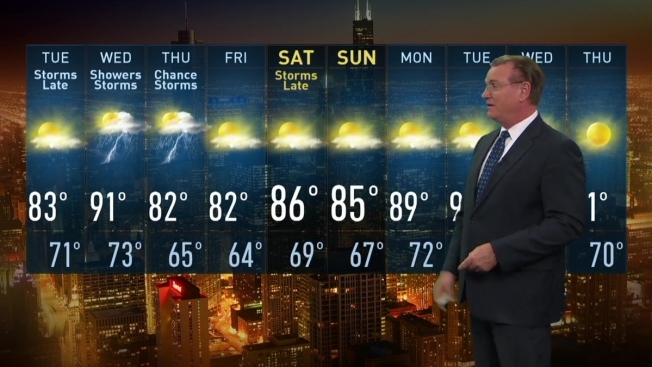 Storms downed power lines, left hundreds without power, delayed flights and made for slick travel conditions across Chicago in the morning and it doesn't appear the wet weather will leave anytime soon. The storms were expected to continue through the mid-morning hours before moving east of the area, but scattered showers and storms could return by the afternoon, some possibly strong to severe. Should storms develop during the afternoon and evening, they could be capable of producing very large hail the size of golf balls, heavy downpours and gusty winds of up to 60 mph. The storms are expected to weaken during the evening hours, diminishing any severe threat by that time. Temperature highs are forecast to sit in the low- to mid-80s Monday. The early morning storms prompted ground delays at O'Hare International Airport and made for numerous crashes on Chicago-area roadways, including one on southbound Interstate 294 just south of the eastbound I-88 ramp. Another crash was reported in Deerfield and on the inbound Edens at Skokie Road. Just before 4 a.m., ComEd reported more than 1,500 power outages in Lake County. Antioch fire officials also said power lines were down near 300 Park Ave. due to weather. The chance for rain continues throughout the week, with isolated showers and storms possible again Tuesday afternoon and evening, particularly south of Interstate 80, but more likely overnight and into Wednesday morning. The threat for showers and storms remains throughout the day Wednesday and again Thursday morning. Early predictions show Friday looks to be partly to mostly sunny with highs in the upper-70s to low-80s with lower humidity levels.